Communication Highwire, as the circus metaphor implies, explores the balancing act inherent in any intercultural interaction: how to remain true to oneself while exploring aspects of other styles, with a goal of achieving more effective communication. After decades of teaching and training across, and about, cultural differences, these three authors have found that labels such as “direct,” “low context,” or “polychronic,” while providing initial insights, are not sufficient for their purposes, and that a more “robust, and dynamic” (p. xi) analysis framework is needed. In addition, unlike most books on intercultural interactions, Communication Highwire moves beyond appreciation of cultural difference to suggest ways to leverage diverse styles for improved communication across cultures. Their model is additive, with a goal of expanding each individual’s communication-style repertoire. The book is divided into four sections: an introduction, five factors affecting communication style, a detailed breakdown of 16 specific styles, and an extensive collection of activities. The authors return throughout the book to the ongoing, often contentious relationship between two businessmen, Mike and Tanaka-san, who struggle to understand each other’s behaviors, articulate their own goals and preferences, try each other’s styles, and ultimately work together productively. Examples from many other cultures and contexts are also used to illustrate the concepts and strategies throughout the book, drawing on the authors’ extensive intercultural experience, both professional and personal. Saphiere, Mikk, and DeVries explore communication across cultures from different client needs and perspectives, and they argue persuasively that successful communication requires a combination of styles. The best coauthored books present a mixture of ideas, experiences, and analysis and we are the richer for these authors’ extensive collaboration. Each chapter, and the themes that carry throughout the text, appear to be the result of extensive discussion, reflection, and collaboration. The book is full of engaging, highly readable examples, discussion prompts, and skills activities, which take the reader well beyond the obvious and the “common sense” of communication theory. Occasionally the sentences get a bit wordy, but the writing is clear and cogent throughout, and the authors do an excellent job of selectively substituting everyday terms where field-specific jargon could simply distract and frustrate the reader. The book also stands out for its gentle reminders to consider multiple perspectives, to “hold…individual goals loosely enough to hear, accept and more fully understand each other’s goals” (p. 79). In addition, the analysis checklists are exceptionally thorough. For example, most intercultural communication (IC) texts simply state that in some cultures one should avoid eye contact with authority figures, yet we all know that eye-contact rules are not that simple. These authors list four different descriptors of eye contact, and while such detailed analyses might seem more than the average ESL/EFL student needs, or can handle, adults in a second-culture context often struggle to adjust their communication behaviors to be more effective with their new interlocutors, and they are often very aware of fine nuances of style. Such students are usually more than ready to embrace this depth of analysis, because they want to understand why their interactions across cultures do not always go as intended. Of particular interest to TESOL members will be the detailed analyses of functional language. Students trained to analyze miscommunication as these authors suggest will be at a significant advantage when discussing, negotiating, persuading, critiquing, or receiving feedback, skills that can come into play in academic contexts, the workplace, when renting an apartment, or opening a bank account. Also addressed are idea presentation, turn taking, expectations of communication process, use of emotion, permeability of new ideas, apologies, requests, praise and disagreement, feedback, and humor, among others. Language for describing details of both vocal characteristics and nonverbal behaviors are also provided. Making this global range of styles explicit is of great benefit to instructors and students alike. The authors also emphasize that no individual will be predictably direct, or emotionally expressive, or quick to touch others in all contexts (to name just a few), but that communication styles are a situational tendency, providing a link between behavior and underlying intentions. To leverage our understanding of others’ styles, they present a four-step method: (a) reflecting, (b) analyzing, (c) discussing, and (d) deciding. While these steps might seem easy to carry out, discussing and deciding are not found in most IC literature, and the authors’ engaging analysis of the ongoing relationship between Mike and Tanaka-san helps instructors and clients develop their own version of the suggested analysis strategies. The book is such a rich source of information and analysis tools to seem, at times, overwhelming, but the outline format and use of charts allow the reader to skim the chapters’ subtopics, selecting the specific communication styles or functions that are most applicable to their client/student population. As for the activities, we have all read step-by-step instructions of skill-building activities and wondered whether we could achieve the outcomes promised by the author. Intercultural and diversity training can be particularly idiosyncratic and context specific, making it difficult for others to duplicate their success. However, the activities presented here are easy to envision, and the tips and suggested adaptations allay concerns that the exercises are too dependent on the original facilitator’s approach. In addition, the relatively large font, line spacing, and the wide margins leave plenty of room for underlining and notes. Communication Highwire is an excellent resource for ESL/EFL instructors whether or not they use the activities in their own classrooms, as the tools provided may help them recognize where, and why, their own interactions with their clients, of any age or level, have gone awry, and what may be causing disconnects in their classrooms. The authors explore culturally different communication styles with depth, clarity, and insight. Communication Highwire would be a useful supplement for teacher-training programs and a valuable addition to any ESL/EFL instructor or trainer’s library, no matter what the level or context of instruction. 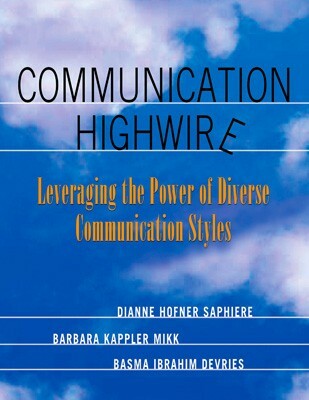 Communication Highwire: Leveraging the Power of Diverse Communication Styles is a gem! This entry was posted in Book reviews and tagged Business, communication, Cross-cultural communication, cross-cultural skills, Cultural Detective, diversity and inclusion, Education and Training, global business effectiveness, Globalization, Intercultural Communication, intercultural competence by Dianne Hofner Saphiere. Bookmark the permalink. I have the book — as yet unread. This detailed review makes me even more eager to read. Your work, Dianne, is inspiring and challenging Interestingly, my colleague and I are just today working on a one-day curriculum focusing on communication cross-culturally. Much of what we are designing parallels the analysis and approach in the book. We entwine DMIS framework with various aspects of communication and stress reflecting on “what are your goals as you communicate?” I’ll be back after I/we have read this book soon. Well definitely please read and use the book, Shan! I think the descriptor checklist in and of itself is worth the price, lol. I would LOVE to hear about your design and results, of the workshop you describe. Sounds exciting. Hi Diane: The book sounds great. Can you send me the Table of Contents and Price? Do you think Sandy’s in GDL will have it or do you have a copy you could sell me? You know the mail situation here in Mexico. Still waiting for a little plastic cell phone case that I ordered over 2 months ago! Suzanne, I have a few copies here. You may need to come to MZT to get it tho 😉 I would love that! Not sure when we’ll be in GDL next. If you’d like I can use Estafeta or Mexican mail…. Email me or call, ok?